When I think of spring, I think not only of these months we’re in but also of the way the season spills right into summer. The fruit appearing at the market of late is just the start—strawberries that will be joined by an army of other bright berries, the first stone fruits hinting at the many varieties to come. The school year decrescendos; nature crescendos. The occasional unseasonably warm day prompts us to pull out our sundresses and shorts and sandals. We’ve nearly forgotten what it feels like to be so warm. For the young, summer is the anticipated moment, the marker indicating the end of one thing and the start of another, the time of such wonder as only sprinklers and ice cream in waffle cones and vacation can provide. I remember well what it felt like: the temperatures creeped upward, the tulips bloomed to my mother’s great delight and I waited impatiently for the day I could walk barefoot through the thick green grass, for the day when sidewalk chalk and library books galore and the radio’s “Lunchtime with the Oldies” would trump desks and homework and routine. The big, square vegetable garden we kept in the backyard was coming alive, and I felt alive, too, in the deepest part of me, awakened like nature from the quiet slumber of winter. For years, we had a screened-in porch in our backyard. It was rather dark inside, with artificial grass that gently scratched our feet. One summer, my parents replaced it with the deck they had long dreamed of having. Suddenly, we could feast out in the open all summer long. My dad grilled; my mom made pies and crumbles with fruit from the market; we sat together for dinner each evening, eating, laughing, enjoying the cooling breeze. We ate off of the brightly colored plastic plates that were reserved for outdoor meals and shouted greetings across the back lawn to our neighbors. We hung a swing from the tree that grew alongside the deck, a development that seemed one of the more glorious and fantastic I’d experienced in my young life. The swing was round and made of teal plastic, with a thin yellow rope stretching up to the strong branch that easily held the weight of my little body. I would swing back and forth, back and forth, nearly convinced that given the chance, I could fly. Something inside of me still says that anything is possible in these warmer seasons, that joy is somehow more readily at our fingertips at the very moment when warmth creeps into our bones. In the mornings, the blessed ones on which neither my husband nor I must wake before the sun, light creeps through the blinds and lands on our bed, throwing geometric patterns onto the blue-gray comforter we’ve pushed to our feet. Was the light so gracious in winter? I didn’t notice. I don’t think it was. I’m ready for meals eaten outdoors, parties with good food and good company and twinkly lights, long walks in the evening light, popsicles on regular rotation, glasses of rosé while sitting on porches. Last summer was filled with wedding plans, a marriage, a move across the country, transitions to the max… I am ready for another go at the season. This time, I just want to take it all in. 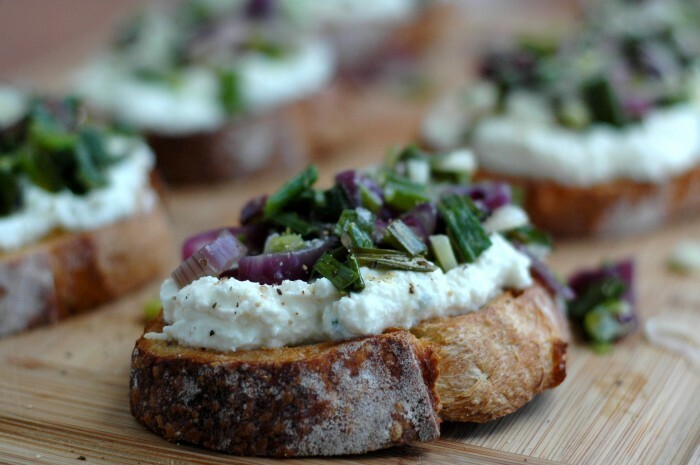 And in the interest of summer dinner parties and simple food, I offer these toasts. 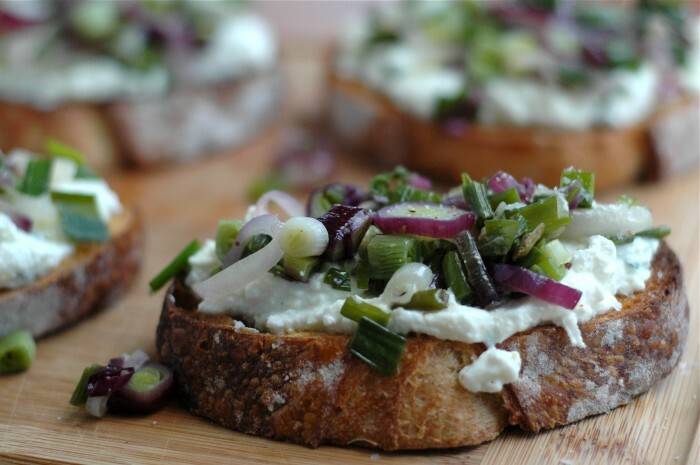 Flavorful spring onions sit atop fluffy clouds of lemony, herbed ricotta, all of this carried on hefty slices of toasted bread. I’ve spoken before of my love of toast, so you’re familiar with my feelings on the subject. Here, I offer a new reincarnation of one of the most excellent foods around. Cheers—to all that is to come! 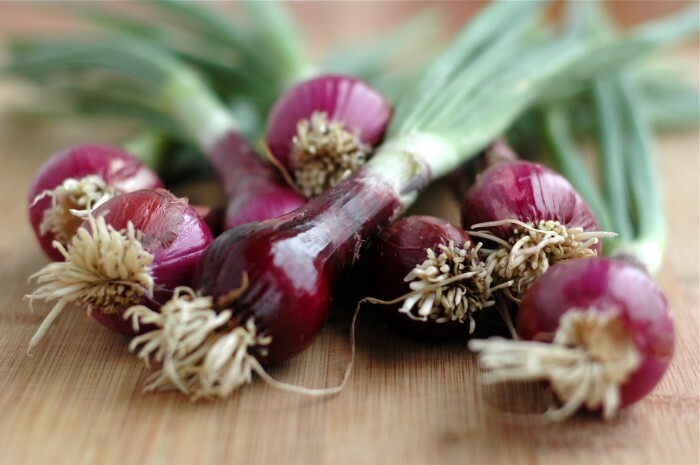 I used red torpedo onions simply because they are so dang pretty, but you can use any kind of spring onion. 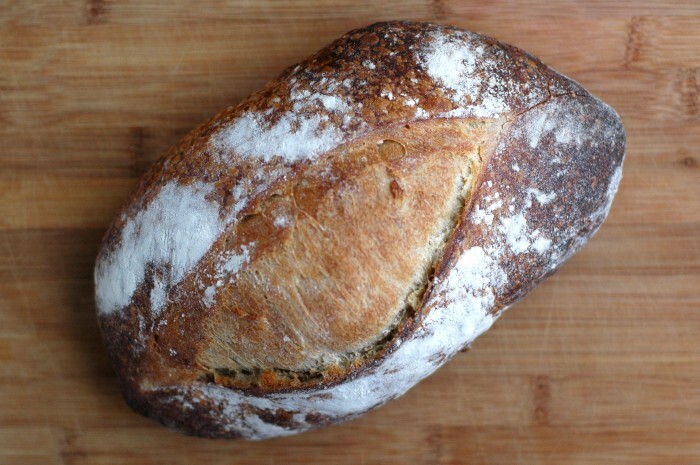 I think a hearty sourdough loaf works best here, but feel free to use another bread if you’d like! 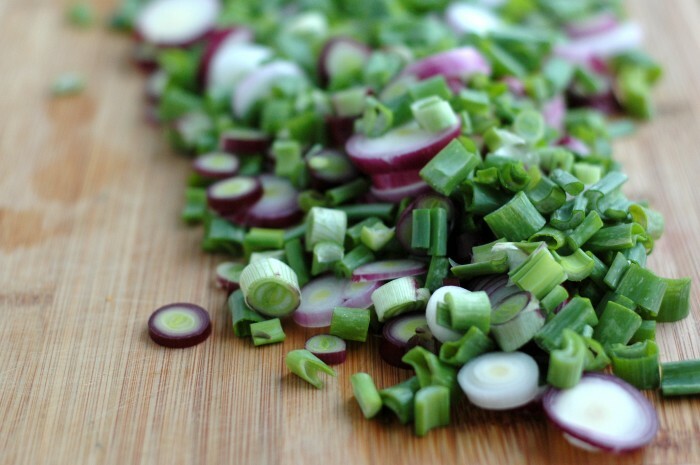 Begin by preparing the spring onions. Trim the tops of the greens and remove the root ends. Slice the bulbs very thinly and the green parts into slices about 1/4 inch thick. In a large skillet over medium heat, warm the olive oil and butter. Add the sliced onions, sprinkle with salt and pepper and sauté, stirring occasionally, until tender, about 5 minutes. Set aside to cool slightly. 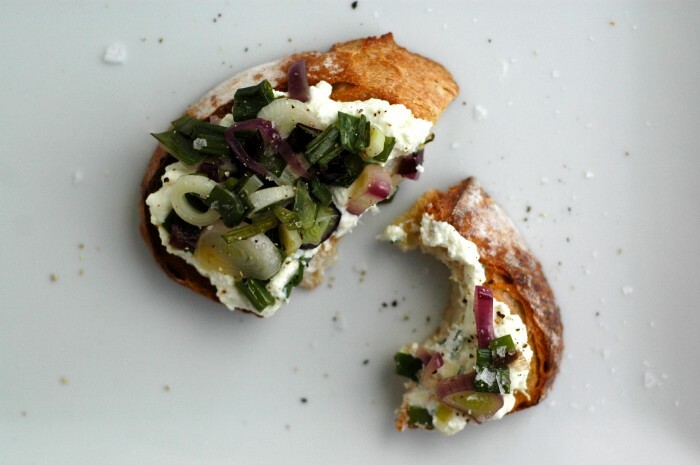 In a medium bowl, combine the ricotta, fresh herbs, lemon zest, lemon juice and red pepper flakes. Generously sprinkle with sea salt and black pepper, and stir again. Set aside. The ricotta can be prepared a few hours up to a day in advance. Keep in an airtight container in the refrigerator until needed. Prepare the toasts. 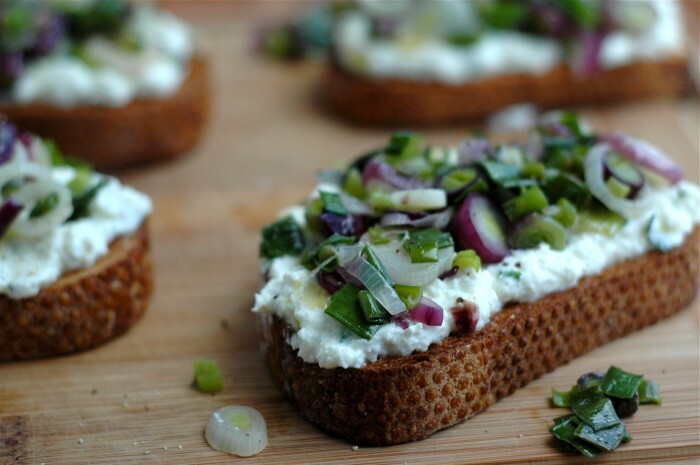 Lightly brush the slices of bread with olive oil. Toast under the broiler for a few minutes, until golden brown. Turn the slices over and broil for another minute or two, until the bottoms brown as well. 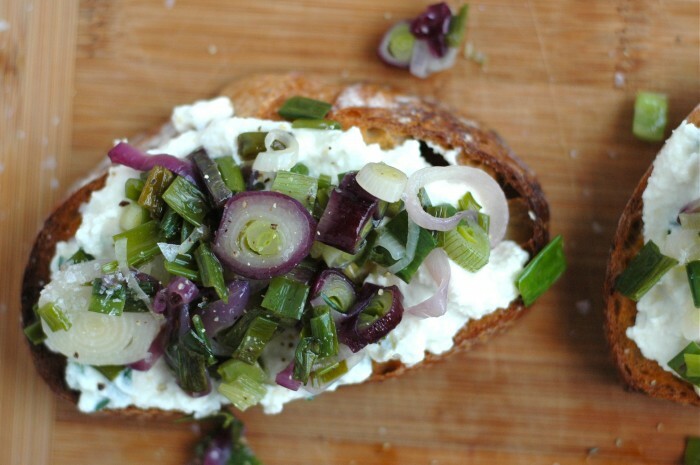 Remove from the oven and rub the top side of the toasts with the cut garlic. 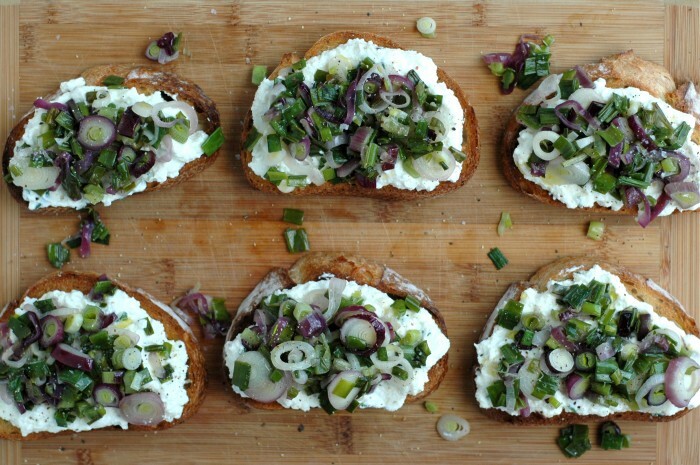 Spread the toasts thickly with the ricotta mixture. Top with a spoonful of sautéed spring onions. Drizzle with olive oil and sprinkle with Maldon sea salt and freshly cracked pepper. Serve warm. I enjoyed your other toast recipes, so I’m sure I will like this one too. The photos are making my mouth water! It is time to switch from soups and hot meals to things like this: easy to carry out onto the deck. We are having a warm spring, so we have already begun meals on the deck while we make plans for the yard and garden. Thanks for sharing your happy childhood memories! Is that loaf from Arizmendi? Looks so delicious! Yes! This is perfect summer food. Cheers to summer! This is beautiful in so many ways. Also, I could eat this everyday. Ah, there is SO much goodness that awaits. Your fond memories of summer’s anticipation and warm instances mirrors SO MUCH of what I remember in my own childhood. The teal swing with thin yellow rope especially. That was like, the ultimate 1/2 hour of post-dinner freedom to me. Sigh. And toast! I didn’t think I could be further convinced of its goodness, but here we are :) That last shot is so great, Stacy.